Thanksgiving was once regarded as “a Yankee holiday.” In the eighteenth century, the clergy in New England used it as an opportunity to rail against the British, and after that issue was resolved, they turned their attention to slavery. The autumnal celebration gained in popularity during the nineteenth century, as New Englanders migrated to other parts of the country. 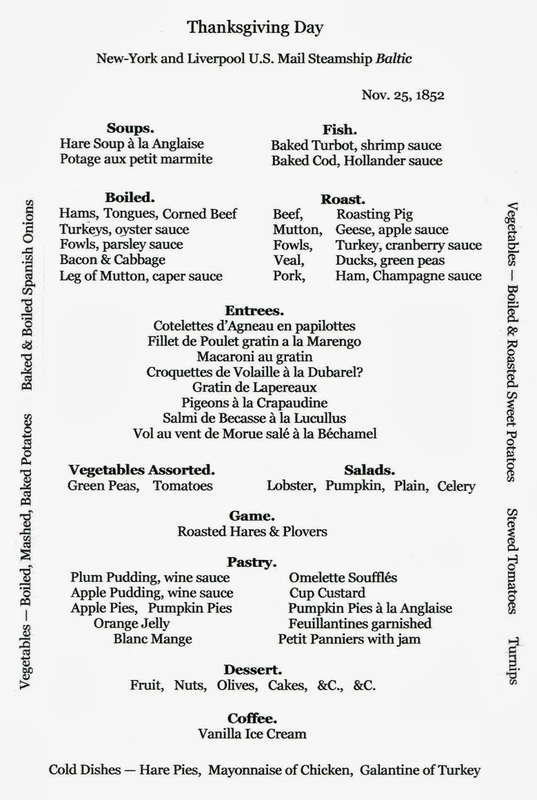 Two menus from Thanksgiving in 1852 stir the imagination, taking us back to a distant time and place. One is a rare survivor from a ship on the high seas. Proclaiming the special day in large script, it stands in marked contrast to a menu from a hotel in Connecticut, where curiously, the reference to Thanksgiving is much less obvious. Oddly enough, all of the pies on the menu were probably made at a pie factory located three blocks away. Established in 1844 by a former blacksmith named Amos Munson, this large bakery produced “toothsome, old-fashioned pies.”6 By the spring of 1849, Munson was shipping over a thousand pies a day to New York City, each with a hand-rolled crust, to the metropolis by steamboat. Although local sales were minuscule by comparison, Munson also made pies for the hotels and eateries in New Haven, then a town of about twenty thousand. 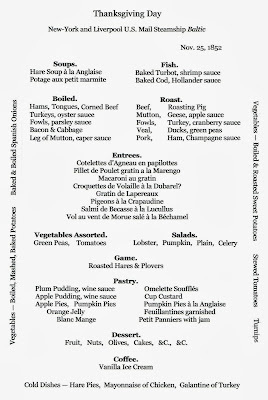 It is entirely possible that the Marlborough pie on the Tontine menu was made as part of a large production run for New York where there was urban nostalgia for the Thanksgiving traditions of New England. 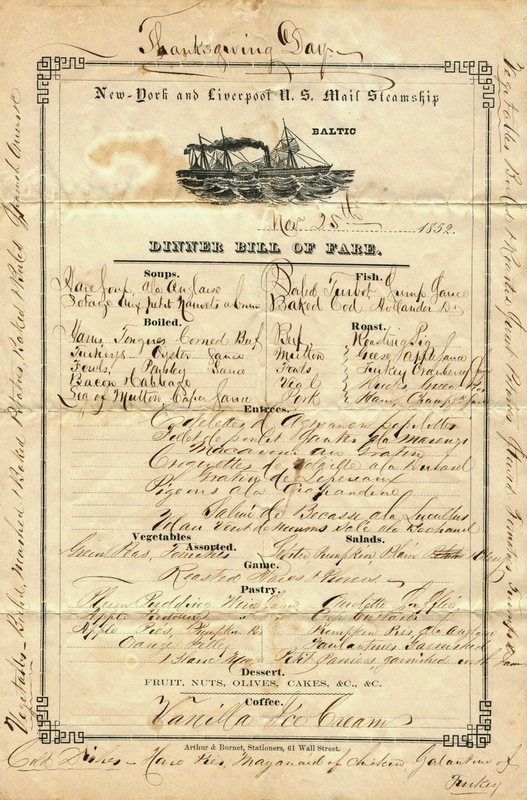 It was a wet and rainy day in Liverpool on November 17, 1852, when the S. S. Baltic departed at noon for New York. There were sixty-eight passengers on board, well below the ship’s 280-person capacity, which was not unusual for an off-season crossing. The dreary weather matched the somber mood. The next day there would be a spectacular funeral pageant at St. Paul’s, where the Duke of Wellington would be laid to rest, thirty-seven years after his victory over Napoleon at Waterloo. In the United States, they were mourning the recent loss of Daniel Webster, the prominent senator from Massachusetts who worked to stave off the sectionalism that threatened civil war. For nearly two years, the political atmosphere had become increasingly tense, as abolitionists defied the Fugitive Slave Act, a provision of the Compromise of 1850 requiring all runaway slaves be returned to their masters. 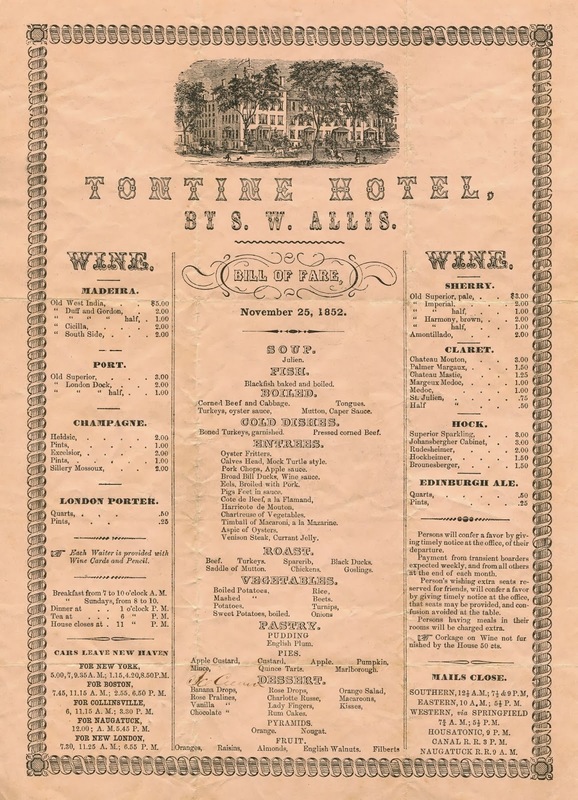 In March, Harriet Beecher Stowe’s antislavery novel Uncle Tom’s Cabin was published, and by June, fourteen steam presses were running day and night, trying to keep up with demand. And only two weeks earlier, Franklin Pierce had been elected president. A native of New Hampshire and former brigadier general in the Mexican War, Pierce was called a “doughface,” meaning that he was a Northerner with Southern sympathies. Rumors were already spreading that the newly-elected president would appoint Col. Jefferson Davis of Mississippi as his Secretary of War. Indeed, there would be much for the Americans to talk about on this voyage; but first, they had to make it through the storm that was grinding its way into the English Channel. 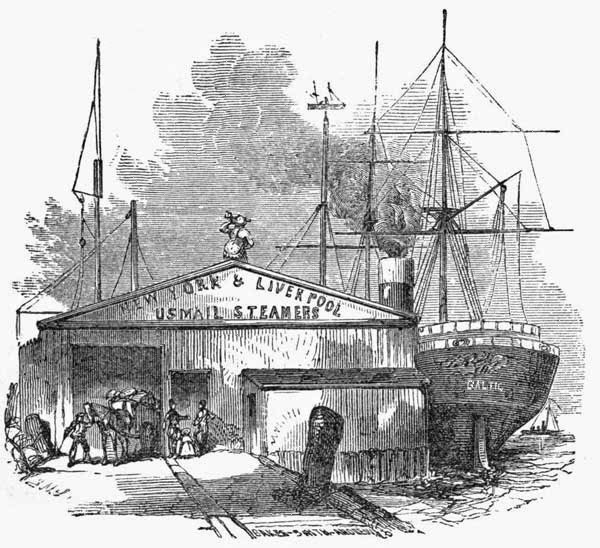 The Baltic was a new 282-foot, side-wheel steamer of the New York & Liverpool United States’ Mail Steamship Company. Popularly known as the Collins Line, the firm operated a fleet of packets offering regularly scheduled passenger service between the two cities. 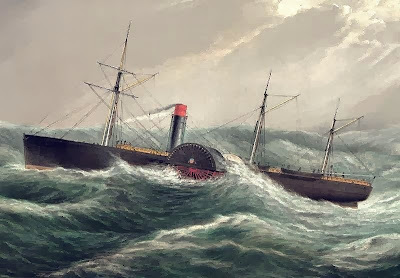 Like her three sister ships (Atlantic, Pacific, and Arctic), the Baltic featured a single smokestack, three square-rigged masts for auxiliary power, and was painted in Line’s colors—black hull with a dark red stripe running the length of the ship and a black stack with a dark red top. The richly-appointed passenger berths were arranged around two large central rooms—a dining room and a grand salon. These expensively-furnished rooms were illuminated by large ventilated columns of patterned glass stretching to the skylight. Unlike its British rival, the parsimonious Cunard Line, the American-owned Collins Line was all about luxury and speed, burning coal at highly-inefficient rates just to shave a few hours off the trip. Powered by two 500-horsepower engines, the wooden-hulled Baltic cruised at 12 to 13 knots, completing the transatlantic crossing in less than ten days when the weather was favorable.7 And if that were not enough, the Collins Line employed French chefs. Thanksgiving arrived on their eighth day at sea. Although the severe gale was behind them, they continued to battle strong westerly winds. Despite the choppy conditions, most passengers had most likely overcome the seasickness that typically plagued everyone during the first few days. Nevertheless, even those who were still feeling queasy would attend this dinner because social etiquette required it—one always went to the table on board ship; that is, if one possibly could. At eight bells (noon), the passengers began to make their way to the dining room through a long, narrow passageway, putting their hands up to one side, and then the other, to support themselves as the ship pitched and rolled. At one point, they came to the place where they had to go up five or six steps, and then down again, passing over the main shaft that connected the engine to the paddle wheel. Soon, they entered the large room where several long tables were spread, each encircled with a ledge to keep the dishes from sliding off. In addition to the side ledges, partitioned-off spaces in the middle kept the dishes, utensils, and glasses in place, even though there would be a lot of sliding and jingling whenever a large wave came along.8 Above each table, suspended from the ceiling, there was a long, finely-crafted shelf with a variety of racks and sockets that securely held the wineglasses, tumblers, and decanters. 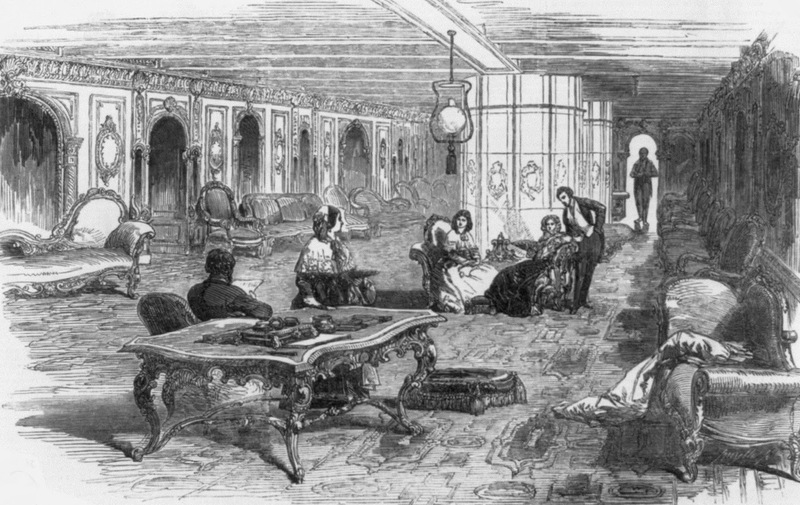 As the passengers staggered to their places and sat down on the cushioned settees, the waiters were already positioned in various parts of the room. The dinner service proceeded very much like that in a fine hotel, except here everything was in constant motion. 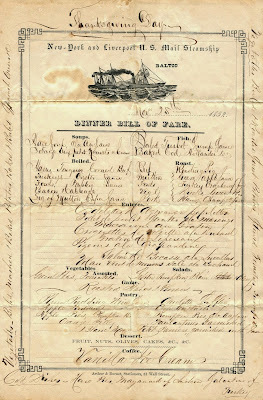 The bill of fare is transcribed below. 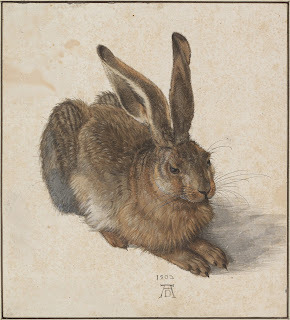 One of the special foods on this westbound crossing was wild hare.9 Unlike rabbit, which has tender white meat, hare belongs to a different genus and has dark muscular meat. (These fast-moving leporids were called “jackrabbits” on menus in the Midwest.) On this voyage, the chef seems to have had a drove of hares at his disposal, since they were used in a soup, a cold pie, and as a game dish pared with plover, a shorebird also exhibiting a gamey flavor. After dinner, the passengers adjourned to the grand salon where the oil lamps were aided by the light of a full moon glowing through the skylight. Three members of the Protestant clergy were on board, and so it is reasonable to assume that this assemblage said prayers and sang hymns, following the usual custom on this holiday. 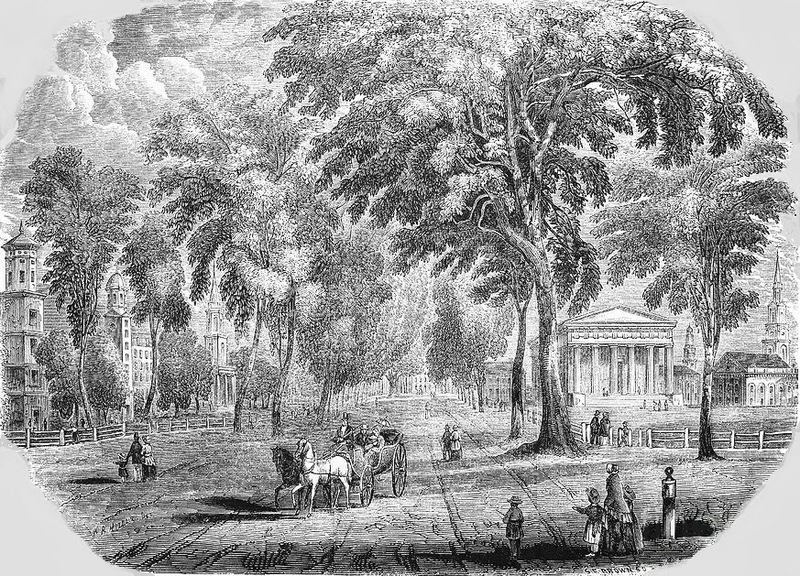 Since one of the ministers was the Reverend Albert Barnes, the sagacious pastor at the First Presbyterian Church of Philadelphia, it also seems likely that some of the sermonizing was about slavery. Earlier that year, Barnes had been quoted by the black reformer Frederick Douglass in his famous oratory “What to the Slave is the Fourth of July?”10 It was no small thing in abolitionist circles, or as events turned out, in the annals of history, to be mentioned by name in Douglass’s rhetorical masterpiece. On Saturday evening, they arrived at the Sandy Hook Lightship, moored in deep water more than twenty nautical miles outside the entrance to New York Bay.11 Sailing no further, they burned blue lights and shot rockets into the air to attract the pilot boat. When the harbor pilot came on board, he climbed to the top of one of the paddle boxes on the side of the ship, where he had an unobstructed view and could shout commands to the helmsman through a bullhorn—port, starboard, steady—as the Baltic resumed steam and headed toward the Narrows, steering clear of the shifting sandbars that made these tidal straits so dangerous. 1. New Hampshire observed Thanksgiving on Thursday, November 11, 1852, two weeks earlier than the other states that year. New York Times, 10 November 1852. 2. New York Times, 22 November 1852. 3. A “tontine” was an investment scheme that provided dividends to the investors. 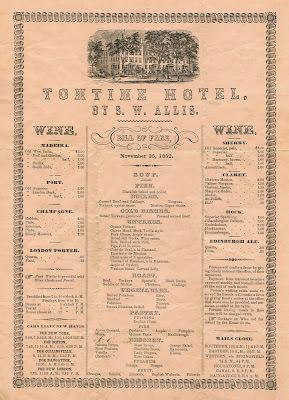 In 1820, 300 people invested $100 each to build the Tontine Hotel which opened five years later. A tontine usually terminated with the death of the last investor who by then owned all of the shares. However, according to the special terms of this agreement, each of the original shareholders could assign their futurity to another person, thereby extending the duration of the investment. When there were only seven shareholders living, the property was to be sold and the proceeds divided, which finally happened in 1908. 4. Experienced Lady, The American Housewife, 1841. 5. Charles Elme Francatelli, The Modern Cook: A Practical Guide to the Culinary Art in All Its Branches, 1859. 6. The pies were so successful that bakers in New York began to produce “Connecticut pies” and a small lunchroom called the Connecticut Pie Depot soon opened. In response, Munson changed the name of his company to Munson’s Connecticut Pies. Within five years, he established another bakery on 21st Street near Third Avenue in New York to supplement his production in New Haven. 7. 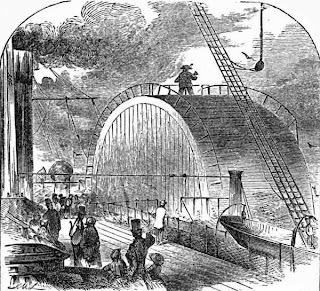 In August 1851, the Baltic set the record for a westbound crossing, completing the trip from Liverpool to New York in 9 days and 18 hours. 8. 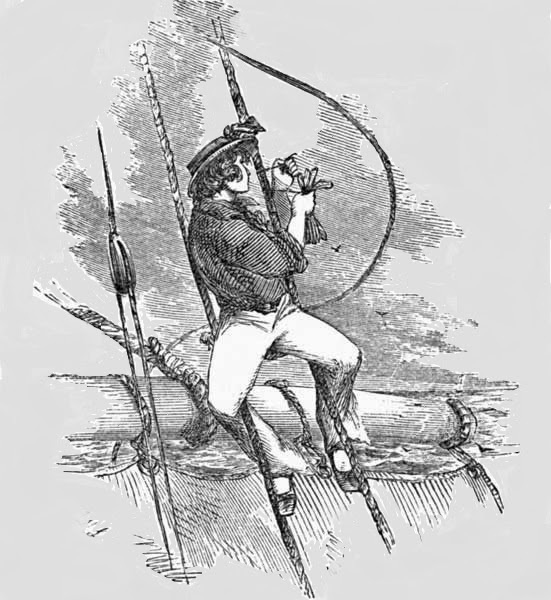 My thanks to Andrea Broomfield for calling my attention to Rollo on the Atlantic, a children’s book by Jacob Abbott published in 1853, providing detailed descriptions of various aspects of a transatlantic crossing on the Collins Line. 9. Specific information about the food on the Collins Line is scarce. 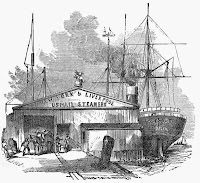 The regular dinner served aboard the S. S. Baltic on 9 November 1852 is reported in Littell’s Living Age, “Steam Packets: English and American,” Vol. 38, July, August, Sept., 1853, p. 170. 11. New York Times, 29 November 1852. 12. In September 1854, S. S. Arctic collided with a French steamer and sank with heavy loss of life. Two years later, S. S. Pacific sailed from Liverpool with almost 200 passengers and crew on board and was never heard from again. The loss of these ships, which some blamed on the excessive emphasis on speed, caused serious financial harm to the company. In 1857, Congress rescinded its generous subsidy to the Collins Line, which led to its assets to be seized the following year. During the Civil War, the S. S. Baltic operated as a coastal transport steamer for the Union Army. Good one. And I like the details about the mass produced pies. This is a marvelous post. I love the details you add about the weather that the Baltic encountered, some of the passengers on board, the historic context of the voyage itself. I, too, was amazed to learn of a pie factory at such an early date! I love seeing that fantastic Baltic menu with your transcription. I'm glad the Rollo book was helpful! Very Interesting as always, I am slightly puzzled by the reference to The English Channel as the Baltic was sailing from Liverpool. Until reading your article I never knew that a jack-rabbit was another name for a hare. For clarity, the Baltic sailed through a storm just off Land's End that was then "grinding its way into the English Channel."